"Roast asparagus is a 15-minute side dish (and YUM)." Snap the asparagus at the tender part of the stalk. Arrange spears in one layer on a baking sheet. Spray lightly with nonstick spray; sprinkle with the Cajun seasoning. Bake in the preheated oven until tender, about 10 minutes. See how to make a classic spring asparagus dish. 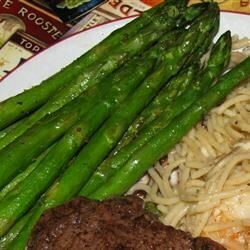 The cajun spice takes away the flavor of the asparagus. Love this-Superfast is right-to make it faster-just line your baking sheet with aluminum foil. When cooked I put them in storage bags to take for lunch-they are great both warmed up or cold. I rubbed olive oil then the cajun seasonings... Really good flavor and very fast! Veggies are still firm and full of flavor. Who would have thought it to be this simple and tasty! Lovely!! I had no cajun spice so I used garlic powder and seasoning salt. I ate the whole thing myself! Everybody loved this! I coated asparagus with olive oil like others suggested. nice and tender. i will definately make this again. thanks!